There’s no doubt that one of the greatest moments in the history of modern medicine was the invention of antibiotic drugs, which have saved countless lives from a wide range of infectious diseases. But it has become clear in recent years that antibiotics are being misused and over-prescribed for both humans and animal livestock, resulting in the emergence of new bacterial strains that have adapted to these life-saving drugs. These dangerous “superbugs” are now highly resistant to conventional, broad-spectrum antibiotics that had been effective in the past, meaning that previously treatable infections may now once again become life-threatening illnesses. But what if there was a more targeted way to eliminate infections within the body? A team of scientists from the University of California San Diego (UCSD) has developed tiny nanorobots that are capable of cleaning up infections in the blood. Their recently published paper in Science Robotics describes how the team went about creating such a robotic alternative for eliminating pathogenic bacteria and the toxins they produce — known as gram-positive bacterial infections — from the bloodstream. These toxins can perforate the outer membrane of the red blood cells, while bacteria can bind to platelets, ultimately causing an infection. Inspired by how real red blood cells and platelets (or thrombocytes, cells which aid in the clotting of blood) work, the team’s tiny robots are made out of gold nanowires. 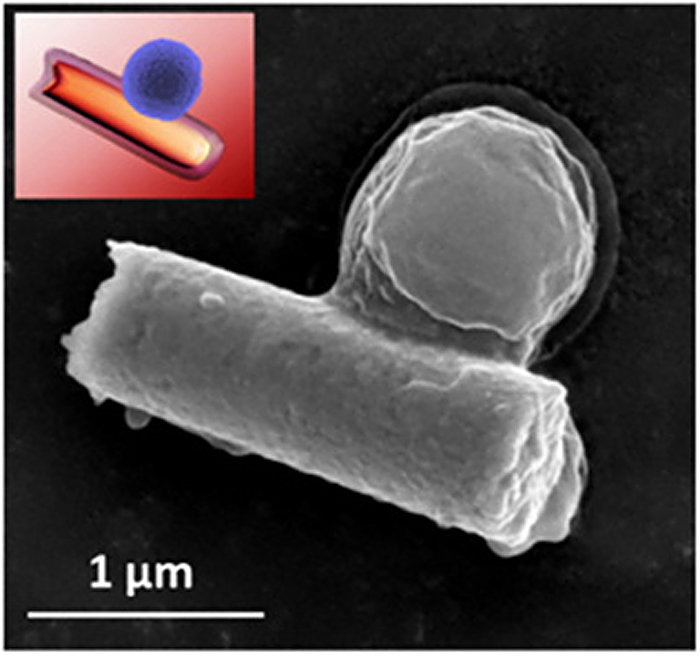 Measuring about one micrometer (1,000 nanometers) long, the nanorobots that have a biological, hybrid membrane on top that is derived from platelets and red blood cells, which disguises them to appear and function like the real thing. “Such hybrid cell membranes have a variety of functional proteins associated with human red blood cells and platelets, which give the nanorobots a number of attractive biological capabilities, including adhesion and binding to platelet-adhering pathogens (e.g., Staphylococcus aureus bacteria) and neutralization of pore-forming toxins,” explained the researchers. MRSA bacterium (colored blue) captured by the nanorobot (red cylinder). This coating also shields the bots from biofouling, which is when proteins start to accumulate on top of foreign objects, hampering how they might ordinarily function. 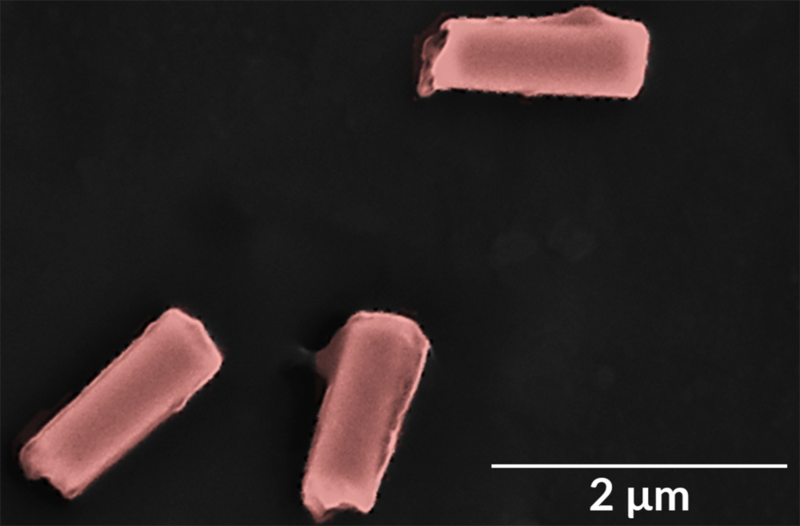 Instead of using harmful chemicals, the nanorobots are propelled with ultrasound or high-frequency sound waves, allowing them to travel about 35 micrometers per second, closely mimicking the movement of real cells and permitting them to mix more freely with potentially harmful micro-organisms in the blood. Besides helping to facilitate a quicker bacterial detoxification of the blood due to a higher number of collisions between the nanowires and their adversaries, this also prevents the tiny robots from being rejected by the body as foreign matter. When these tiny nanobots in disguise are injected into the bloodstream, they attract the attention of the bacterial invaders which mistake them for actual red blood cells or blood-clotting cells. The bacteria will then attack these camouflaged bots, attaching to them as they might usually do to a regular red blood cell. However, the bacteria will find that they cannot break free of the nanowire, and their toxins are then neutralized. During their experiments, the team used the nanorobots on blood samples that had been infected with methicillin-resistant Staphylococcus aureus (MRSA) and found that after five minutes, these samples had three times less bacteria and toxins than samples that hadn’t had any intervention at all. In addition, the team found that using ultrasound to initiate movement in the bots resulted in a 2.4-fold lower number of red blood cell ruptures, and a 3.5-fold increase of bacteria binding to nanowires, compared to nanorobots that were not exposed to ultrasound for propulsion purposes. The team is now planning to expand their testing onto mice, and developing the nanorobots out of biodegradable materials rather than gold. The researchers also intend to improve the design of the acoustic propulsion system for deploying the nanorobots in other biological fluids. There are also plans to potentially use the nanorobots for delivering drugs to precise spots in the body — something we’ve seen previously in other research projects that focused on DNA-based nanorobots. Ultimately, the aim is to create a “broad-spectrum detoxification robotic platform” that can not only clear up infections of the blood and deliver drugs, so that we won’t have to rely solely on pharmaceutical remedies.